Okay, the holidays are over, and it’s time to get back in the blogging saddle. The Go BIG or Go Home Road Trip (2010 Holiday Edition) is over, and we’re back into our routines. Routines which, sadly, include shoveling snow and administering Children’s Sudafed. I did learn a few things from our 1,900-mile automotive journey from New York to Florida, and back again. Namely, that TSA patdowns must surely have gotten a bad rap, relative to sitting in a car for 24 hours with two kids. 1. Assume that it’s cheap to drive. For the four of us, driving to FL was more affordable than flying during the holidays, when airfares skyrocket in line with demand. But while it was cheaper, it was not cheap. Our expenses for the four travel days, including gas, meals, and accommodations, totaled $903.42! By the way…taking the train? Almost as expensive as flying! 2. Underestimate how long the drive will take. Google Maps says it will take 10 hours from Point A to Point B. Your GPS unit says it will only take nine hours , 50 minutes. Don’t be fooled. It will take 12 hours. You will have to stop for gas and potty breaks, at the very least. You will want to stretch your legs, breathe fresh air, and untangle the two angry children wrestling in the back seat because one of them crossed the invisible center borderline. 3. Start out without hotel reservations. This is one mistake we didn’t make, happily! You may consider leaving your overnight lodging up to chance, depending on how far you get. That’s risky when you’re traveling with kids, and want some assurance of a clean, safe place to stay. Also, if bad weather forces people off the road, hotels may get overbooked. Find a hotel near where you think you’ll end up, make a reservation, and make note of their cancellation policy. If your family doesn’t own a T.V. , kudos. On the road, you will need to plug the kids in eventually, or all of you will go crazy. (Yes, I am clairvoyant.) Part of the fun in travel is to have experiences they don’t get at home, so why not entertainment too? PIXAR movies, in particular, appeal to children of all age groups, and keep the peace. 5. Set out with absolutely no idea where your next meal will be. This could lead to disaster if you have young children who get cranky when they’re hungry. We have some of those, and the snacks I packed didn’t always cut it. It was important to have some idea of where and when we were stopping for meals. 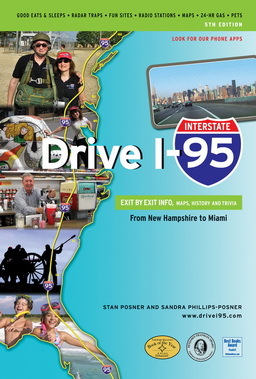 While we were on I-95, this guidebook became an invaluable resource: Drive I-95, by Stan Posner and Sandra Phillips-Posner. I actually downloaded the PDF version to my laptop; how “eco”! On the first day of our return trip, it helped me avoid trouble when lunchtime was approaching, and I realized that we wouldn’t make it to the Applebee’s off Exit 6 in Georgia. My first clue was The Girl’s fervent demand, “When are we eating lunch? !” One look at the map, and we found a Wendy’s off Exit 373 in Florida. Close call, but nothing four chicken nuggets couldn’t help. I find it remarkable that the authors have visited every single exit along I-95 from Maine to Miami! In addition to listing restaurants, they provide exit-by-exit info on lodging, gas stations, attractions close to the highway, campgrounds, mechanics, and much more. And I’m happy to add that we have a copy to give away!! Because we all love Go BIG or Go Home giveaways, don’t we? Want to enter? Just sign up to receive our e-mail notifications (see upper right hand corner). Alternatively, you can comment below and tell me which of the road trip mistakes listed above you’ve made, and what happened as a result. The juicier the story, the better! A winner will be chosen randomly, and a winner will be notified next Tuesday (1/8/10). 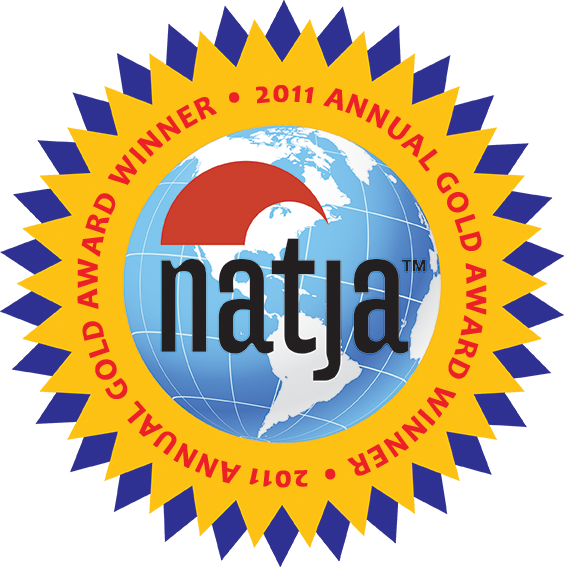 The winner will be asked to provide a mailing address within the U.S. or Canada. Ugh, the train — SO expensive!! I looked both at ATL > NOLA and ATL > NYC trips the other day and just don’t get it. Even with kids going at half-price, it is still prohibitive!! Really well written Traci – it takes true talent to turn 4 days in the car with your family into a fun story. My husband, son and I did the NY/FL drive a few years ago. It will never be repeated. We made almost all the mistakes you listed and added one of our own – we can drive straight through! No hotel stops, our son was taught how to pee in a bottle, and away we went. We made it in 24hrs but it was so not worth it. The grown ups were shot and our son over tired. One thing we did right was not let our son plug in at home for a week before the trip, no tv, no games, no movies. Once we got in the car and set him up with the DVDs he was thrilled! My husband is making noises about driving down this year, great family learning experience, etc, I told him the only thing our son needs to learn is Delta’s reservations number. Driving straight through will only be considered when The Boy is old enough to drive some of the way! When I was a kid, my family didn’t make hotel arrangements for our 12 hour drive to Panama City Beach, FL from Indiana during the busy spring break period. We crossed the Alabama line late at night, and subsequently stopped at every exit we passed for 2 hours before we found a room. I think we checked in around 4 a.m. I distinctly remember my mom throwing a fit in the front seat, worried she was never going to be able to take a shower again. What a funny post. Glad you all made it home in one piece. Regardless of the issues you may have encountered, I am sure that your family did a lot beter than the thousands of families that were stranded at one of many US airports for at least some delay time over the holidays. Everything that I read seemed to indicate that it was not fun traveling through the airports this past holiday season. nice post. My wife and I are not fans of flying so we end up driving a lot. Love the tip about eschewing electronics. While in the ideal world kids can sit contently without driving each other and more importantly us parents crazy it just doesn’t happen. We love dual DVD players and the Nintendo DS. However, once the car trip is over so are the electronics. OMG. Change your final destination and remove the Sudafed, this was our trip to South Carolina. I think I have this book at home – great post! Fun post! But re: #4, it’s not an absolute to have to plug in, or tune out, the kids. We’ve survived many road and plane trips over the years without tv or gameboys, by engaging them with audiobooks. Example: One 32 hour round trip from Vancouver to San Francisco = two Harry Potter audiobooks. Talk about silent and spellbound kids, and adults! Our challenge is that our son is 10, and our daughter is 3. I did a lot of research in audiobooks before the trip, but it was difficult to find titles which would appeal to both of them. We had some success with The Mouse and the Motorcycle! 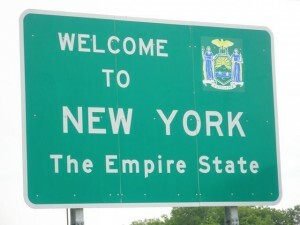 I’ve done the NY/FL road trip a few times, and it’s not so bad since my kids are older. We can drive 10 hours, with just a short stop for gas and snacks. And, we don’t pack videos, but do bring audiobooks. I never liked to book hotels ahead of time because I was never sure where we would stop, but I’ve been burned by that philosophy more than once. My worst road trip mistake is thinking road trips are cheap. Summer before last, I took the kids on a road trip across America. It was a 2 month loop from East to West, and back, that I thought would be inexpensive since we like to camp. I didn’t take into account how tiring it is to make camp day after day for such a long time. We ended up staying in many “budget” hotels, some fairly scary, few truly cheap. I had to hightail it home when we maxed out the credit card. Sounds like a really great trip though, before the credit-card-maxing-out part! We’re thinking of renting an RV this summer and visiting the Midwest. The world’s largest ball of twine in KS is on my bucket list! We make the trip from NJ to Florida yearly and some years twice a year. We have it all down pat now but let me tell you we have seen it all. One year, there was a truck spill on I-95 and the chemicals that flowed from the tanker up ripped up the road. We spent about 6 hours getting off I-95 and making our way down the road to get back on I-95. We did not have a map for the state this happened in and it was pre-GPS – what a nightmare! Another year we were forced to cancel our hotel reservation due to bad weather and traffic. Not knowing where we would be when, we decided to wing it. Big mistake! We ended up at a hotel that was having computer problems and their system was down. They put us in a room and an hour later put someone else in the room! Between someone trying to get in and the front desk calling the room I had nightmares all night. I don’t know HOW we lived before the GPS! Thanks for your story; the part about someone trying to get in your room gave me shivers! Glad you guys are all home. 🙂 Love your tips. I have to say the iPhone is saving us on our trip from NY to GA. We started off late so we weren’t gonna make it. I took out my iPhone and use Priceline app to bid on the hotel before we arrived. Don’t know how our parents traveled pre-electronic age! It was meant to be, for you found your Garmin! We have one too; we call her “Nuvi,” the name of the model, since we’re too lazy to come up with something more original. We have the American woman’s voice, and it is so soothing to hear when you’re lost in the middle of a not-so-great neighborhood! Deliver us to safety, Nuvi! For people traveling Interstates other than I-95, there’s a book called The Next Exit that lists restaurants, gas stations, etc. for all United States Interstate Highway exits. It can be very helpful when planning meal and gas stops. My husband and I (after much nagging on my part) took Am-Track from Florida to NY 2 years ago. That was the 1st leg. We went on to Wisconsin and planned to ride back with a stop-over in DC for Memorial Day. Great plan right? I had my laptop along as well as a camera and notepad, planning to blog all the way. My husband was afraid to leave our bags and the laptop to walk back to the dining car. We took turns carrying everything with us and staggering down the aisles. Not fun. We sat… a LOT. By the time we made North Carolina, I was sitting on my pillow, shifting from hip to hip and in too much pain to enjoy the sights. It was dark anyway. A family sat all around us, coughing and sneezing. By the time we got to NY, my rear was in serious pain and I was sneezing. By the time we got to Wisconsin (after a few days in NY) I was seriously ill and cursing the day I dreamed up this nightmare of a trip. We canceled our train trip home and flew! I never thought I’d see the day I’d be happy to see the TSA line-up at the airport. And all this was without kids! Can you just imagine? I still want to ride the train to DC, during the day this time, and with a 3 day stay before heading home. Oh no! That doesn’t sound like the great adventure I’m sure you had planned in your mind! Another thing I realized about road trips in the winter months — it gets dark so early, that you won’t get the chance to enjoy the scenery for a large part of the trip!